"Welcome to the Cannes Film Festival, kid." 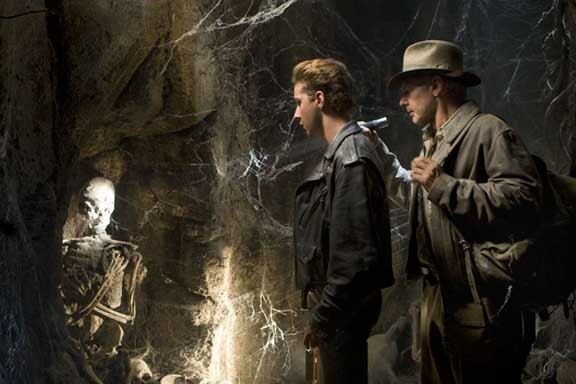 "Indiana Jones and the Kingdom of the Crystal Skull" screened all over the world yesterday -- on a Sunday afternoon, roughly in synch with the gala unveiling of the picture at the Cannes Film Festival. The usual film-festival and press-screening review embargoes were promptly ignored, so although the movie opens May 22, many outlets ran full reviews on their websites immediately. Because... well, because they could, I suppose. Variety even posted a preview of the review that its reviewer was about to write, in case, after 19 years of anticipating the next "Indiana Jones" movie, you couldn't stand waiting one more minute while he took the time necessary to process and record his thoughts about the film he'd just seen. Not because he believed it was great or a disaster or even because he had anything in particular he wanted to say about it right away, but because... well, Daily Variety knew its readership simply could not do without knowing instantly that the movie "begins with an actual big bang, then gradually slides toward a ho-hum midsection before literally taking off for an uplifting finish." OK! Doesn't that just whet your appetite for the full-course review? Why did I think I would be in a minority? Because of what David Poland at Movie City News poetically described as "one idiot." As everybody knows, an exhibitor attended a closed-door screening last week, and filed a review with the Ain't It Cool News website. This single wrong-headed, anonymous review was the peg on which The New York Times based a breathless story on a negative early reaction to the film ["Indiana Jones Is Battling the Long Knives of the Internet"]. That story inspired widespread coverage: Were Spielberg and Lucas making a mistake by showing their film at Cannes? Would it turn out to be a fiasco like showing "The Da Vinci Code" there? The Code got terrible reviews, and only managed to gross something like $480 million dollars at the box office -- suggesting, if not to the Times, that even a negative reception at Cannes might not cut Indy off at the knees. Daily Variety: Shame of an Industry. On Sunday, Indiana Jones faces a challenge more terrifying and dangerous than anything he's encountered onscreen: the Cannes crowd. The jet-lagged, overtired, cynical mob of critics and executives decimated "The Da Vinci Code" when it debuted here two years ago, with festgoers giving terrible reviews to the film -- and even to Sony's expensive after-party. Since then, no Hollywood film of that magnitude has screened for the fest crowd. So, to boldly present the world premiere of the fourth "Indiana Jones" movie at Cannes must have represented a considerable risk, right? Because "jet-lagged, overtired, cynical" mobs of critics and executives are so cranky they can't be expected to like big, glamorous movies at the Cannes Film Festival, can they? And yet... they didn't hate it. 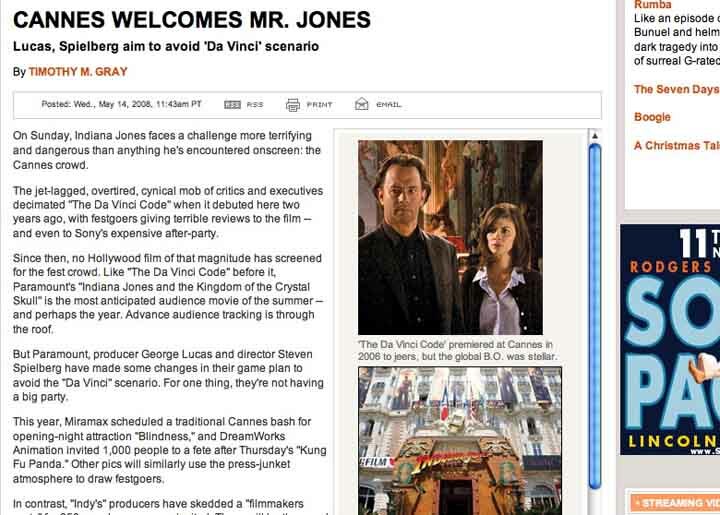 "‘Indiana Jones’ debut survives Cannes critics" read the headline over the AP story at MSNBC.com: "The film received none of the derisive laughter or catcalls that mounted near the end of the first press screening for 'Da Vinci Code.'" That's right, the big news is that derisive laughter and catcalls were not heard. And Generalissimo Francisco Franco is still dead. I saw the film with a group of five people, and the resulting opinions were across the board. One of the guys expected to hate it and ended up loving it. And for another one of my friends, it was the complete opposite. Speaking for myself, I was expecting very little going into the screening, and I had a lot more fun than I ever could have expected. Yep. That's what happens. Some politicians have based their entire careers on setting low expectations, just so they look better by comparison. It works. Whether the audience was disappointed or just wrung out by the two hours of chase sequences and noise is probably less relevant than that so many of us dutifully filled the theater, which of course is the scenario that Paramount Pictures hopes to replicate worldwide when the movie opens across the globe on Thursday. I’ll have more to say on the movie then, by which point it will already have been thoroughly masticated, spit out and chewed all over again in the media that has already sunk its little teeth into Indy’s tired body with early negative notices. I was bored out of my mind while watching the movie, which makes me think that Steven Spielberg was terribly bored while directing it. But that’s a germ of an idea that I would like to actually contemplate for a few days. Now, I think Spielberg is a movie genius (and "Close Encounters" and "E.T." are masterpieces about the language of film, written in light), but the idea of him making a fourth "Indiana Jones" movie does not excite me even a little bit. One of the masters of the medium has now devoted roughly one sixth of his feature-film output to Indiana Jones movies. Meanwhile he could have been exploring new territory, as he did with "A.I. Artificial Intelligence," "Always," "Munich"... Spielberg is reportedly doing a "Tintin" adaptation next, and that I want to see. He hasn't already made one three times before and, as an admirer of his work, I appreciate that. Next Article: Temple of Doom: Bang a gong, sing a song Previous Article: Star-struck: Movie criticism or astrology? Star-struck: Movie criticism or astrology?